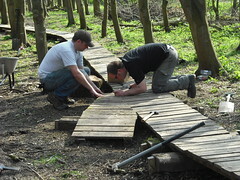 We usually organise at least two trail build days each month. Check our events page for details of upcoming build days (look for the icon). The aim of this article is to explain how the days work and what to expect. Firstly, we don’t mind when people turn up or leave. Our attitude is that anyone who turns up has already made more effort than most people. We recognise that people have other commitments and time pressures. We tire as the day goes on, so it’s great to have some people turning up fresh. You don’t need any qualifications or prior experience. There are always a range of jobs to do; you don’t have to have spent 10 years in the construction industry or be an elite level downhill rider to help out. We’ll always find people a job to do that suits them. If you do have a skill or experience that might be useful then don’t be shy – tell us all about it. We like letting people get on with contributing. Some people just come along to bring cakes or have a chat. That’s fine, we regard that as support. You don’t need to be exceptionally strong. We’ve discovered efficient ways of working and the best tools to use which means we’ve minimised the amount of mindless wheel barrow pushing. This means that volunteers can work on interesting and creative jobs rather than taking part in a personal endurance event. The way we run most days is that we have at least one main job that we want to progress. We will always have some ideas and things prepared. The exact details are usually open to discussion and we like to have a proper group experience where we work out what to do collectively. Some really good ideas have come out of this, and we’re always ready to reconsider the plans. Our approach seems to work pretty well – we avoid wasting loads of time agonising over what we’re trying to do, but there’s flexibility for people to contribute to the trail. Volunteers are not slave labour. People wouldn’t come back if that was the case – we’ve got a good team of keen people now. We’re always pleased to see more though. Anyone who turns up to help gets a say in what goes on, so don’t worry that you’ll encounter a tight clique of trail nuts. 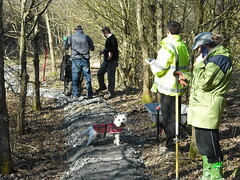 Regarding the trail layout, we spend a lot of time walking round areas and discussing the overall plan. This goes on for months. It means that once work starts we have an overall plan which we explain to anyone who wants to know. The details are then decided on the day with whoever is there. 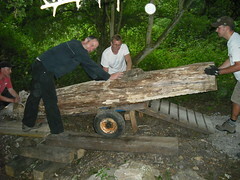 You can see how the trail has progressed via our Croft Trail history page. 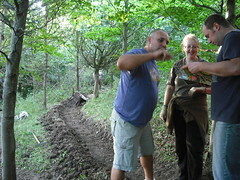 Trail build days are a lot of fun. It’s an excuse to be outside doing something practical. It’s stress busting – you’re free to get on with things however you want, with like minded people, chatting about trails and riding or what was on the TV last night. There’s also the satisfaction of contributing to the trail and riding things that you built. What to wear: any old clothes will be OK unless it’s a really wet day. Old jeans and T shirts are fine. Tracksuit bottoms can be comfortable for this sort of activity. If you’re really into digging and hacking it is worth considering getting some safety boots. Discount retailers like Brantano sell steel capped boots for around £30. Gardening gloves can be useful too. Most people bring food and water too. There is a Coop store about a mile away that’s worth a visit if you’re hungry. We sometimes have a barbeque at the trail. We usually bring backup chocolate with us. 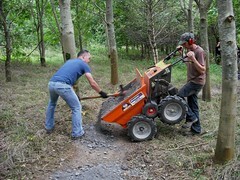 We’ve got a few videos showing trail building that should give you more of an idea of what the days are like. It would be great to see you at one of our future events! Tom.